This cutaway view of Saturn’s moon Enceladus is an artist’s rendering that depicts possible hydrothermal activity that may be taking place on and under the seafloor of the moon’s subsurface ocean, based on recently published results from NASA’s Cassini mission. 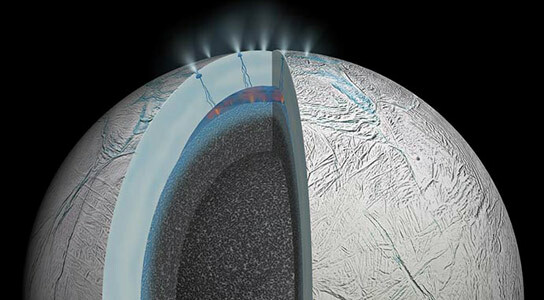 Using data from NASA’s Cassini spacecraft, two newly published studies reveal the first clear evidence that Saturn’s moon Enceladus exhibits signs of present-day hydrothermal activity which may resemble that seen in the deep oceans on Earth. The implications of such activity on a world other than our planet open up unprecedented scientific possibilities. 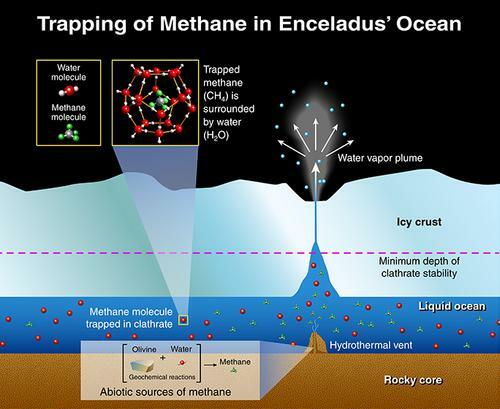 This illustration depicts potential origins of methane found in the plume of gas and ice particles that sprays from Enceladus, based on research by scientists working with the Cassini Ion and Neutral Mass Spectrometer. The Cassini-Huygens mission is a cooperative project of NASA, ESA (European Space Agency) and the Italian Space Agency. NASA’s Jet Propulsion Laboratory in Pasadena, California, manages the mission for the agency’s Science Mission Directorate in Washington. The Cassini CDA instrument was provided by the German Aerospace Center. The instrument team, led by Ralf Srama, is based at the University of Stuttgart in Germany. 1 Comment on "Saturn’s Moon Enceladus Exhibits Signs of Hydrothermal Activity"
when I read this this morning, I got excited and my heart start beating harder and faster.